T.V. Paul is James McGill Professor of International Relations in the department of Political Science at McGill University. Paul specializes and teaches courses in international relations, especially international security, regional security and South Asia. He is the author or editor of 18 books (all published through major university presses) and nearly 60 journal articles or book chapters. In September 2018, Paul became a Fellow (Elected) of the Royal Society of Canada. T.V. Paul was elected as the 56th President of International Studies Association and on March 17, 2016 he took charge as ISA President for 2016-17. He delivered the presidential address on the theme: “Recasting Statecraft: International Relations and the Strategies of Peaceful Change.” In the presentation, he called for the International Relations discipline and its theoretical paradigms to devote more attention to strategies for achieving enduring peace among states. For the full text of the speech, see: ISA Presidential Address . For the Power point see: ISA Presidential Address PowerPoint . As ISA president, he spearheaded the Global South Task Force whose report and recommendations were adopted by the ISA Governing Council in San Francisco in March 2018. Paul was born in the Indian state of Kerala (Mevellor, Kottayam District) on November 10, 1956 and his early education was at institutions in Kerala. He completed his Masters in Political Science from Maharajas College, Ernakulum (affiliated to Kerala University) in 1980 and then worked as a journalist for the Press Trust of India (PTI) news agency in New Delhi from 1980 till 1985. During this period, he completed his MPhil from the School of International Studies (SIS), Jawaharlal Nehru University. From July 1985 till July 1986 he spent a year at the University of Queensland, Australia, as a research scholar. In July 1986 he was admitted to graduate studies at the University of California, Los Angeles (UCLA) from where he completed his PhD in Political Science in June 1991. In September 1991, he began his teaching career at McGill University where he was appointed as an assistant professor, promoted and tenured to associate professor in 1995, and full professor in 2000. In 2003, he was awarded the prestigious James McGill chair, instituted in the name of the university’s founder. He has been a visiting professor of National Security Affairs at the Naval Postgraduate School, Monterey, California (2002-03), visiting scholar at the APEC Study Center, University of California, Berkeley (2013), East-West Center, Honolulu (2013), Center for International Affairs (CFIA) and the Olin Institute for Strategic Studies, Harvard University (1997-98), and James Martin Center for Nonproliferation Studies, Monterey (2002-2003). He was the founding Director (2009-12) of the McGill-University of Montreal Center for International Peace and Security Studies (CIPSS), which originated from the Research Group in International Security (REGIS) which he co-directed for over a decade. 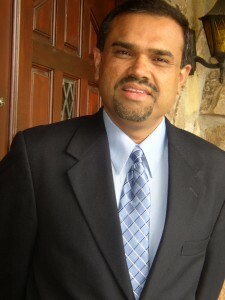 Between 2009 and 2011 he served as the Chair of the International Security Studies Section (ISSS) of the International Studies Association (ISA) and during 2013-14 as ISA’s Vice-President. Currently, he serves as the editor of Georgetown University Press’ South Asia in World Affairs book series and on the editorial boards of many scholarly journals. He has travelled widely and given scores of seminars at leading academic institutions worldwide. Paul has made a number of contributions to the study of international relations, especially broader international security and South Asia. He is especially known for rigorous puzzle-driven scholarship utilizing case studies as opposed to paradigms. He has been a proponent of eclectic modeling which he uses in several of his works. He is also a conceptual innovator and has made contributions to topics such as asymmetric conflicts, soft balancing, tradition of nuclear non-use, and status accommodation of rising powers. His first major book: Asymmetric Conflicts: War Initiation by Weaker Powers (Cambridge University Press, 1994) was pioneering as it addresses a neglected question of materially weaker powers starting wars against their stronger opponents. In his second authored book: Power versus Prudence: Why Nations Forgo Nuclear Weapons (McGill-Queen’s University Press, 2000) he created a prudential realist model to explain the choices of many technologically capable states to forbear nuclear weapons. His third book: India in the World Order (co-authored with Baldev Nayar, Cambridge University Press, 2003) offers a rare theoretical exploration of India’s search for major power status and the constraints and opportunities that it has faced in that endeavor. Paul’s important policy-relevant contribution is the 2009 book: The Tradition of Non-use of Nuclear Weapons (Stanford University Press). This book explores the reasons why nuclear weapons have not been used since 1945, especially against non-nuclear states. In March 2010 his co-authored book: Globalization and the National Security State (with Norrin Ripsman, New York: Oxford University Press) was published. It tests several of the globalization related hypotheses on state behavior in the security arena in a variety of regions and powers. In Fall 2013 his authored book: The Warrior State: Pakistan in the Contemporary World will be released. It explores the question of Pakistan remaining a weak and insecure state despite expending enormous efforts to military security. Paul has continued his scholarly contributions in nine edited volumes and over 55 journal articles/book chapters in venues such as International Security, Security Studies, Journal of Conflict Resolution, Review of International Studies, Journal of Strategic Studies, International Studies Review, and Millennium. The edited books are: Status in World Politics (with Deborah Larson and William Wohlforth, Cambridge University Press, 2014); International Relations Theory and Regional Transformation (Cambridge University Press, 2012); South Asia’s Weak States: Understanding the Regional Insecurity Predicament (Stanford University Press, 2010); Complex Deterrence: Strategy In the Global Age (with Patrick M. Morgan and James J. Wirtz, University of Chicago Press, 2009); The India-Pakistan Conflict: An Enduring Rivalry (Cambridge University Press, 2005); Balance of Power: Theory and Practice in the 21st Century (with James Wirtz and Michel Fortmann, Stanford University Press, 2004); The Nation-State in Question (with G. John Ikenberry and John A. Hall, Princeton University Press, 2003); International Order and the Future of World Politics (with John A. Hall, Cambridge University Press, 1999, 2000 (twice), 2001, 2002 & 2003); and The Absolute Weapon Revisited: Nuclear Arms and the Emerging International Order (with Richard Harknett and James Wirtz, University of Michigan Press, 1998 & 2000). Five of his books have also been published in South Asia Edition editions by Cambridge and Oxford University Presses in India. At the end of the Cold War, the United States emerged as the world’s most powerful state, and then used that power to initiate wars against smaller countries in the Middle East and South Asia. According to balance-of-power theory—the bedrock of realism in international relations—other states should have joined together militarily to counterbalance the U.S.’s rising power. Yet they did not. Nor have they united to oppose Chinese aggression in the South China Sea or Russian offensives along its Western border. This does not mean balance-of-power politics is dead, argues renowned international relations scholar T.V. Paul, but that it has taken a different form. Rather than employ familiar strategies such as active military alliances and arms buildups, leading powers have engaged in “soft balancing,” which seeks to restrain threatening powers through the use of international institutions, informal alignments, and economic sanctions. Paul places the evolution of balancing behavior in historical perspective from the post-Napoleonic era to today’s globalized world. Here Professor Paul presents on his book, Restraining Great Powers, on the use of international institutions, informal alignments and economic instruments such as sanctions — to constrain the power and threatening behavior of dominant actors. At the University of Oregon, Professor Paul holds an informal discussion with students on the topic of restraining great powers. Professor Paul discusses his book, Restraining Great Powers at the London School of Economics. For an interesting podcast discussion on changing great power relations, listen to my conversation with Professors Patricia Goff and David Welch at Balsillie School of International Affairs. 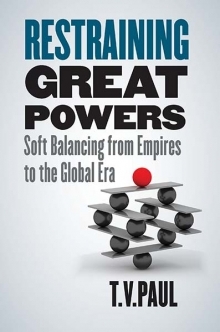 I conduct an interview with Professor Peter Jones from the University of Ottawa, discussing my latest book, Restraining Great Powers: Soft Balancing from Empires to the Global Era. An Q&A with McGill’s Arts Student ambassador Amy Hauer, in anticipation of my new book, Restraining Great Powers: Soft Balancing from Empires to the Global Era. Carnegie Book Discussion on Restraining Great Powers October 18, 2018. Montreal Launch of Restraining Great Powers, September 27, 2018. China-US Rivalry: Sleepwalking into War?, Madras Courier, October 29, 2018. If confidence building measures and the adoption of an arms control regime in the South China Sea, China and the US risk stumbling into a catastrophic war. Future of International Institutions and Soft Balancing, Yale University Press Blog, October 18, 2018. Institutions have long been used as a means for soft balancing, including by the US. However, the US and its allies cannot ignore the norms of the rules based international order, for to do so risks undermining the shared norms soft balancing depends on. The Power of Non-Alignment, The Hindu, October 11, 2018. Finding themselves caught between the giants of the United States and China, small states of the Asia-Pacific are not destined to become pawns in the midst of great power competition; instead they can resurrect the ‘Bandung spirit’ and adopt a policy of non’alignment through the use of soft-balancing. Soft Balancing vs. Hard Clashes: The Risks of War Over the South China Sea, Global Asia, September 21, 2018. To minimize the risk of conflict in the South China Sea, all parties should consider measures to alleviate the dangers that arise from time pressures. How India Will React to the Rise of China: the Soft-Balancing Strategy Reconsidered, War on the Rocks, September 17, 2018. To restrain China India is likely to form both a soft-balancing coalition and limited hard balancing coalition, but the formation of a traditional hard-balancing coalition with the United States is very unlikely. Asean and soft balancing: Time to declare South China Sea a zone of peace? Member states of Asean have been pursuing a strategy based largely on soft balancing and diplomatic engagement towards China for over three decades.. Read more at straitstimes.com. To restrain Donald Trump’s actions, “soft balancing” ? countering through international institutions, diplomacy and economic sanctions ? holds promise.